DART is committed to creating a safe and secure experience for riders and strives to ensure a safer region for all North Texans. That’s why we work daily on a number of passenger and community initiatives to improve the safety and security of the entire system. Through partnerships with the community and the public, and proactive awareness and preparation, we can all keep DART (and make North Texas) a safe place to live, work, and visit. 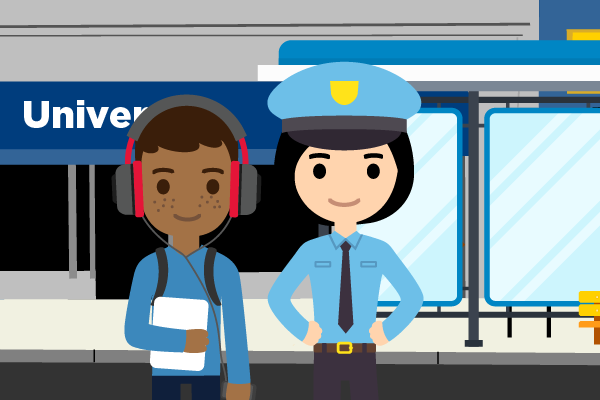 You may have seen one of our DART police officers, fare enforcement officers or security guards out on your daily commute or responding to a transit-related emergency from time to time. These brave men and women have dedicated their lives to protect passengers and residents in, on, and around the DART system. Established in 1989, the DART Police Department helps carry out our mission to operate a safe transit system for North Texans. DART police officers are licensed peace officers with all the same rights, privileges, duties, and obligations as any other police officer in the state of Texas. National Night Out. This unique, annual community-building campaign brings together citizens, law enforcement, community groups, businesses, and local officials for a night of community-building to make our neighborhoods safer places to live. Operation Lifesaver. Throughout the year, the DART police participate in and present at Operation Lifesaver events and safety fairs. Formed in 1972, Operation Lifesaver is a program that seeks to educate drivers and pedestrians alike about rail safety. Santa Cops. DART Police volunteer in the Santa Cops program, which provides meals and toys to needy families and children during the holiday season. DART Police and volunteers have spread Christmas joy to thousands of families over the years. It’s our DART – and it’s up to us to help keep it safe. That’s why DART also offers a number of safety and security initiatives and tools for riders and non-riders alike. The DART Say Something Safety and Security app gives riders an easy, discreet way to report safety concerns directly to DART Police. Through the app, riders or concerned citizens can send photos, videos, text descriptions, and locations of suspicious activity. The app also provides safety alerts issued by DART Police, allows users to share their location on a map and indicate whether they need help, and works with the DART mobile website where they can access other information. DART also offers a Passenger Guide to Safety and Security with tools and tips to help strengthen and enhance the security measures being taken by the DART Police Department. Tips for a safer, more secure ride include staying aware of your surroundings, keeping valuables out of sight, holding personal items at all times, and reporting any suspicious or criminal activity to DART Police via the Say Something app, by texting 214-256-1819, or by calling 214-928-6300. Get more bus and rail safety tips by visiting DART.org. DART is part of the Safe Place Program, a national non-profit organization that helps young people facing crisis situations by strengthening community safety nets. When a young person in crisis needs help, all they have to do is approach any uniformed DART employee and let them know they need a safe place. DART employees then coordinate with other local organizations to help ensure the child is transported to a safe, secure location. DART works to make transit in North Texas safer and more reliable than ever before—but we can’t do it alone. That’s why we rely on the help of the DART Police, innovative tools like the Say Something app as well as the input and assistance of riders, passengers, and local residents. Together, we are making North Texas a safer place for all who live here.